Microphthlamia or better known as the Lethal gene is caused by breeding a roan x roan or Dalmatian x Dalmatian together. Studies show that there is a one in four chance of guinea pigs born from the breeding of a roan x roan or Dalmatian x Dalmatian will result in having a lethal baby. 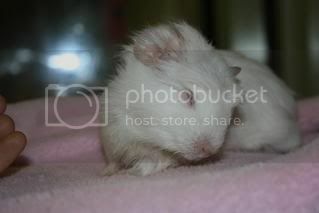 Many affected guinea pigs will die. Responsible breeders will never intentionally mate these breeds. 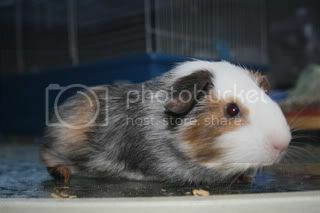 Sings of a lethal guinea pig. · Born dead or has a short life. 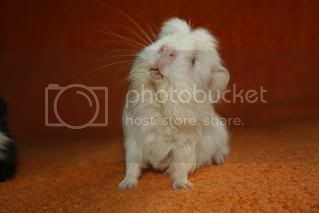 · A lethal guinea pig is always born completely white with red eyes this is not just a colour but because these guinea pigs are born without any skin pigmentation. Lethal guinea pigs can be very lovable pets and live a normal life although they will need ongoing vet care to make sure they stay happy and healthy. 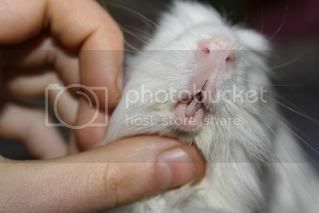 Photos of a Microphthlamia (Lethal gene) Guinea pig below. 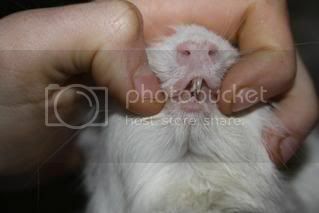 Some Guinea Pigs may have the Roan or Dakmatian gean without it being visible. 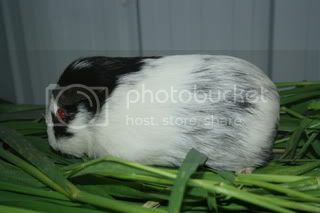 A roan is a breed of guinea pig with white hairs mixed with another solid colour. A Dalmatian is a breed of guinea pig. Dalmatian Guinea Pigs are known for the design on its coat - it basically resembles a Dalmatian with a white background covered with black spots.